Gara Garayev (also variously Qara Qarayev and Kara Karayev), a giant of Azerbaijani culture, was certainly its most significant composer. It is therefore extremely heartening that this disc gives us the opportunity to hear the first ever recording of his Sonata for violin and piano, and the first complete recording of his 24 Preludes for piano. It is interesting to read that as a student at the Moscow State Conservatoire he was able to attend classes given by Shostakovich who the notes explain “...had a powerful influence on the young composer”. That is evident from the very first notes of the Sonata for violin and piano. If I had not known that it was by Garayev, I would certainly identified it as being by Shostakovich or, failing that, Weinberg. The first movement of the Sonata is one of bold and assertive statements. A strong main theme on the piano set against a caustic reply from the violin makes for a movement with wonderfully contrasting themes that satisfy and excite in equal measure. The main theme may be influenced by Azerbaijani folk music but it also sounds Jewish. That is why both Shostakovich and Weinberg come to mind, since both used Jewish rhythms and folk influences a great deal in their music. The similarity with music by Garayev’s teacher is far less apparent in the rest of the sonata. The second movement opens in a searching and somewhat agonized way. The violin plays alone until the piano calms it down, encouraging an altogether more relaxed atmosphere. Some degree of questing, however, is still apparent, and the movement concludes on a wistful note. The third movement, a short but delightful and gentle Pastorale, offers a complete contrast to what has gone before. The final movement requires more gravitas. 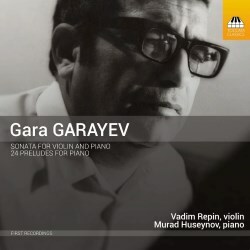 Garayev delivers it with a slow, almost plodding and weighty theme from both instruments until echoes of the opening movement appear and the sonata finishes in an upliftingly hopeful atmosphere. Twelve years in composition, Garayev’s 24 preludes are a considerable achievement. They open with a driving theme, contrasted quickly by the second gentle piece. The third is again a total contrast, with another pulsating and insistent one. Number 4 is serious but shades of Debussy hover in the background. The fifth has what can only be Azerbaijani folk-like themes which disappear all too quickly to be replaced by the last of Book I, a proudly declaimed theme that pleases and excites. The contrasts continue: first a gently unfolding prelude, then a disturbed almost funereal eighth. Number 9 has a gentility that contrasts completely with its predecessor. Number 10 is a dynamically powerful one, so different to the whimsical eleventh. Azerbaijani themes reoccur in the closing prelude of Book II. The suggested dramatic conclusion gives way to a gentler close that segues nicely into the first of Book III, an elegant and intricate prelude. Stately is the overriding nature of prelude number 14, whilst the seemingly flippant nature of the 15th dances along in a skipping manner. No. 16, a gentle and beautiful little gem, has a theme that expanded could lead to something much larger altogether. The 17th prelude enters forcefully and carries on in the same vein. The last of Book III is a thoughtful one to close with. Book IV opens with an interesting prelude, with two themes going in different directions. Number 20 has Bachian overtones in the form of a fugue. The following 21st keeps the Bachian atmosphere but from more obviously 20th century view. Number 22 is a reflective piece that has much to say in its tiny timeframe. The penultimate prelude in complete contrast invokes jazz in its brief two-minute appearance. The last one of these 24 begins quietly enough but in the middle explodes briefly before ending as it began to round of the set in a dignified close. The entire set of 24 preludes is wholly satisfying. It could easily be enjoyed alongside Shostakovich’s set of preludes and fugues. It is fitting that its first complete recording should be by Murad Huseynov, a pianist from Garayev’s Azerbaijan. He has obviously studied them closely, for he relies only on his memory in the performance. Offered as a bonus is a DVD of both works, directed by Juliette Swierczewski, a Paris-born film director with a background in music. She has studied the cello, which she has played as a semi-professional for fifteen years, and operatic singing, obtaining a diploma from Trinity College, London. She writes about her motivation for making what can only be described as loving tribute to the music. She was inspired, she recounts, by the impression of autumn that the 24 preludes made upon her. So, taking that theme she has the two musicians strolling towards the performance area, a small clearing in a forest. The autumnal theme is accentuated by pianist Murad Huseynov finding the piano’s top strewn with fallen leaves. Swierczewski goes into considerable detail about dolly shots and the atmospheric addition of mist which swirls around the musicians’ feet at one point. The main thing, however, is that for music lovers it is a pleasant backdrop against which to hear these enthralling works, and both musicians are powerful advocates for them.